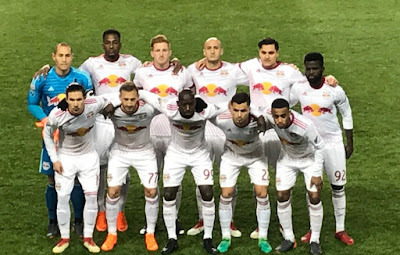 The Red Bulls lined up on Tuesday night before their win over Tijuana. Photo by Jason Schott. The Red Bulls and Chivas Guadalajara will face off in the Scotiabank CONCACAF Champions League Semifinals on April 4 and April 10. The first leg will be in Mexico on Wednesday April 4 at 10 p.m. eastern time kick off and will host the return leg at Red Bull Arena on Tuesday, April 10 at 8 p.m. The Red Bulls advanced to the semifinals with a 5-1 aggregate win over Club Tijuana, while Chivas moved on with a 3-1 aggregate over Seattle Sounders FC. The Red Bulls cruised in their quarterfinal match against another Mexican side, Club Tijuana. The Red Bulls won both matches in the series, a feat that no other MLS squad has done against a Mexican opponent. New York won leg one on the road, 2-0 then earned a decisive 3-1 victory at Red Bull Arena on Tuesday night. their 12th league title on an 4-3 aggregate score over Tigres UANL. Tickets for the home match on April 10 will be available to New York Red Bulls Red Members via an exclusive pre-sale tomorrow, Friday, March 16, and will go on-sale to the general public on Tuesday, March 20. Additional details of the presale will be communicated tomorrow, with presale information sent directly to Red Members. Fans can buy tickets online at newyorkredbulls.com/tickets or by calling 1-877-727-6223 between the hours of 10 a.m. and 5 p.m. ET.